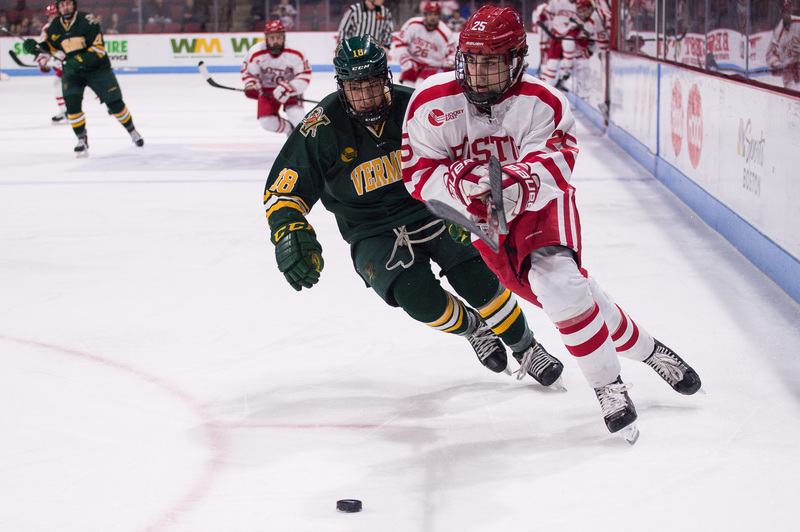 With only two games remaining in the 2017-18 regular season and home ice on the line, the Boston University men’s hockey team had a lot to play for Friday night in the first of two matchups against the University of Vermont. The Terriers (17-13-3, 12-8-3 Hockey East) were able to so, clinching home ice for the upcoming Hockey East quarterfinals with a 2-0 win over the Catamounts (9-18-6, 6-12-5 Hockey East) at Agganis Arena. With the win, BU head coach David Quinn now has 100 victories over his five years at the helm of the team. Although, for Quinn, it was simply another “big win” for the team. Freshman forward Logan Cockerill and sophomore forward Patrick Curry were both absent from the game’s lineup due to illness. Sophomore forward Patrick Harper, who has not played since Jan. 6, will also not appear in Saturday night’s matchup. “He’s not going to play again tomorrow night, but I think we’ll have more answers tomorrow,” Quinn said of Harper’s condition. Graduate transfer forward Drew Melanson got the Terriers on the board first at 5:37 in the first frame after beating Vermont sophomore goaltender Stefanos Lekkas on the power play. Freshman forward Hank Crone fed the puck to junior forward and assistant captain Jordan Greenway, who was fresh from competing in the 2018 Winter Olympics. Greenway wasted no time being back with BU as he set up Melanson on the left side of the net. In the second period, both teams had quality looks, but Lekkas and Terrier sophomore goaltender Jake Oettinger stood tall between the pipes. Both senior defenseman and captain Brandon Hickey and senior forward Nikolas Olsson were sent to the penalty box during the period. Although, BU successfully killed off the pair of penalties, eventually going 4-for-4 on the penalty kill for the night, something Quinn was very impressed with. Quinn also noted Greenway’s contributions to the team’s penalty kill unit. “He’s just done a really good job on the penalty kill ever since he’s been here and it was real good to have him back,” Quinn said. Despite Lekkas’ 15 saves in the second period, it was freshman forward David Farrance that was able to sneak the puck past him. Freshman forward Ty Amonte broke up the puck and got it to Farrance in the neutral zone, who then blasted a shot from the left face-off circle into the top right corner of the net to put the Terriers up 2-0 at 17:05. This marked Farrance’s first collegiate goal. 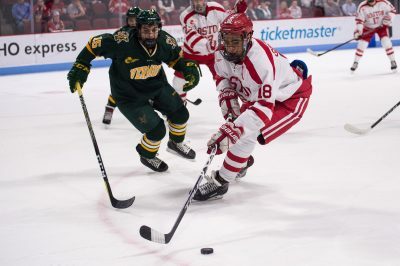 The Victor, New York native played as a defenseman during the first semester for BU, but was moved up to forward by Quinn during the Beanpot semifinals against Harvard University. Vermont outshot BU 12-8 in the final frame of the contest, but neither team found the back of the net and Oettinger notched his eighth career shutout after making 33 saves. Freshman forward Brady Tkachuk almost grabbed the empty-netter to seal the contest only for the puck to ring off the post. Despite the missed shot, Quinn thought his team played “smart hockey” in the final frame. You can definitely see your expertise in the article you write. The world hopes for more passionate writers such as you who aren’t afraid to say how they believe. At all times go after your heart.